Remembering With Maurice | Miguelito's Little Green Car. We are all connected. 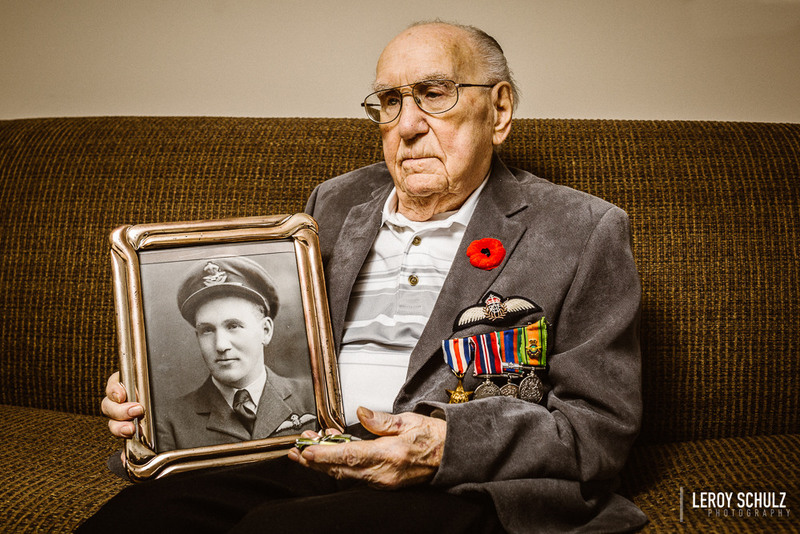 Maurice James Strong is a decorated Royal Canadian Air Force pilot who survived a major plane crash in World War II. After the war, he was stationed in Germany where he was tasked with “impressing, even taunting the Russian pilots” while guarding the border. He served with the RCAF from 1940-1946. Maurice recently celebrated his 97th birthday, which was attended by his son Keith, daughter Denise, his six grandchildren, and seventeen great-grandchildren. While stationed in England, Maurice met his wife Joy through his best friend, a fellow pilot. He tells the story of a time while posted in Germany when his popularity soared among his fellow service men. For quite some time the men had been subjected to eating Spam for three meals per day. He had enough of that, so he took his rifle into the woods surrounding their post and promptly hunted and returned with a deer. His star rose quickly after that. His daughter Denise remarks that he is a patient, positive father who never complained — not even about the major injuries he sustained from his service. Because of injuries from a plane crash, his right eye is a prosthetic eye. He keeps a small, die cast model of a Supermarine Spitfire, the aircraft that he flew. After the war he worked as a meteorologist in Whitehorse, Fort St John, Calgary, and Edmonton for the then-named Department of Transport until his retirement in the 1980s. He would like you to check out his grandson Ryan Anderson’s band F&M. * Disclaimer: This post was provided by said grandson, Ryan Anderson. But seriously, check out F&M. They are supremely talented musicians.